Peace Country Wolves runner Kobe Grocholski parlayed a trio of personal best performances on the weekend into a spot on Team Alberta for next month’s Tri-Province Meet in Winnipeg. 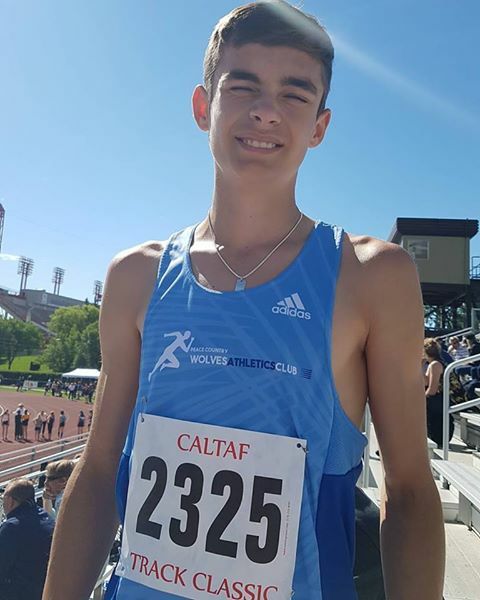 Competing at the 2017 CALTAF Classic on Saturday and Sunday in Calgary, the 15 year old Beaverlodge resident placed second in the Midget Boys 1200m (3:23), fifth in the 2000m (6:14), and third in the 800m (2:05). All three times were well under the national standard needed to qualify for Legion Nationals. Valleyview’s Aimee Caron also took part in the CALTAF meet placing 14th in her first attempt at the Youth Girls 100m Hurdles and 33rd in the 200m. The Tri Province Meet brings together the top U16 and U18 track and field athletes from Alberta, Saskatchewan, and Manitoba. It takes place from July 14 to 16 in Manitoba’s capital. This entry was posted in Outdoor Track and Field and tagged Athletics Alberta, Beaverlodge Alberta, CALTAF Classic, Grande Prairie AB, Kobe Grocholski, Peace Country, Peace Country Wolves Athletics Club, Track and Field, Tri Province Meet. Bookmark the permalink.